An AK-47 pistol is a great choice for a rifle-caliber handheld. Let’s face it, AR pistols are just too trendy these days. Besides, why shell out for a Daniel Defense or SIG SAUER when you can have just as much fun for less in many cases? AK pistols are great for range use or as a truck gun or implement of self-defense though load selection is critical. Ball rounds are for the range; you need either a hollow point or frangible round for home defense. The Soviets thought so too; what we call an AK-47 pistol is actually a variant of the AK-74, a revised AK-47. The original AK-47 was revised within a few years of release, culminating in the AKM. The AKM is made from stamped sheet metal, with reinforcing ribs to make it strong enough to function. The AKM was in turn replaced in the 1970s with the AK-74, which was revised for the 5.45x39mm round instead of 7.62x39mm. Part of Mikhail Kalashnikov’s work on the AK-74 was the creation of the AK-74U – first released in 1973 – was a short-barrel variant developed for use by paratroopers and other personnel in need of a carbine rather than a full service rifle. Somewhere along the way, it picked up the nickname of “Krinkov gun” but the reasons for that are lost to the mists of time. Granted, if you wanted something compact and powerful, you could just buy a 191…just kidding. If you want to leave an angry comment below because of that joke, I promise to read it and feel bad about myself because of your devastatingly incisive and lettered riposte. Also, a bit about AK-47 pistols and the NFA. The National Firearms Act only classifies a short rifle as such if it has an attached or folding stock. If the firearm itself does not have a stock attached to it, it therefore is classified as a pistol. Many such firearms have a stock that can be deployed via a bracket, strap or other means, but they aren’t considered an NFA firearm because the stock isn’t permanently attached to the receiver. By comparison, something like, say, a Springfield M1A with folding stock or a Paratrooper model of modern M1 Carbine (like the ones made by Auto Ordnance) would fall under NFA restrictions if overall length or barrel length were reduced to NFA specifications for a short barrel rifle (aka SBR) as the stock is permanently affixed to the rest of the gun. With all that out of the way here are some abbreviated AK-47 pattern guns. Some are for capitalist dogs that have been sequestering away their rubles, and others won’t break the bank. One of the most popular on the market is the Draco pistol, offered by Century Arms. 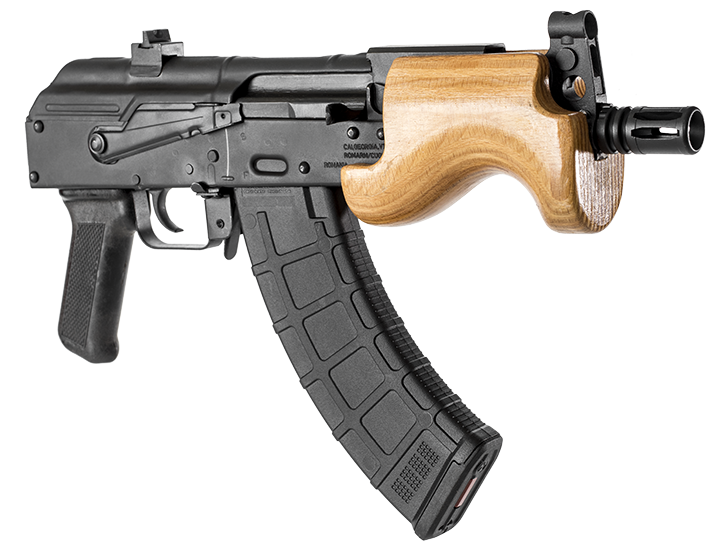 The Draco family of AK-47 pistol firearms is manufactured by Cugir, a Romanian firearms concern. The base model (Century dubs it the HG1916-N) is chambered in 7.62x39mm, features a 12.25-inch barrel, for an overall length of 21.5 inches and weight of 5.5 pounds. The receiver is stamped (as AKs usually are) and it will accept all AK-compatible magazines. MSRP is $724.99, but what the MSRP is and what you’ll find it for in-store are two different things! Should you prefer an even shorter model, Century also offers the Micro Draco. The Micro Draco has a 6.25-inch barrel, shortening overall length to 14.5 inches and reducing weight to 4.85 lbs. It features a contoured wood forend for a bit better grip if desired. The reductions in barrel length and the contoured stock adds another $20. Another AK pistol to look out for is the PAP M92 pistol. The PAP is manufactured by Zastava Arms in Serbia. Zastava makes a number of replica/clone firearms, including the M88 line of Tokarev (TT-type) pistol replicas. The PAP, chambered in 7.62x39mm, has a stamped receiver, with 10-inch barrel and 19-inch overall length. Unloaded weight is 5.69 lbs. Aftermarket stocks are available for it should you desire. This Eastern Bloc banger can often be found for about $600 or less. SAM7K with attached pistol brace. Courtesy of Arsenal. Arsenal Inc. has a couple of AK-47 pistol models as well. The SAM7K is the model to acquire. The SAM7K starts with a milled receiver rather than stamped. You can choose the SAM7K-03 with a traditionally-shaped polymer forend or a quad rail. Barrel length is 8.46 inches, overall length is 30 inches, and the gun weighs in at 5.5 pounds. The party piece is that the SAM7K is compatible with Sig Sauer’s pistol brace, so that piece is easy to source. You can expect to part with around $1,000, which – given the build quality and features – offers the best blend of affordability, quality and features. Century Arms also produces the C39v2 AK-47 pistol in-house. The received is milled instead of stamped, and the pistol features a polymer forend, side-scope rail mount, attachment points for a sling, and a chrome-moly nitride treated barrel that will stand up to surplus ball ammunition (which is often corrosive) unlike many import AK pistols, which do not. MSRP is only $879, so it’s budget friendly AND packed with features. It will also accept the Shockwave Blade stabilizing brace with a special Century Arms adapter. You can purchase those components separately, or get them with the C39V2 Pistol for an extra $70. Century assembles it stateside, but they used to sell a Romanian-built (by Cugir) version, the RAS47. Since pistol braces aren’t integral to the firearms’ frame, they don’t fall under NFA regulation…at least yet. If you want something made of some sterner stuff, Israeli Weapons Industries makes an AK47 pistol, the Galil ACE. The Galil rifle isn’t a true AK, but an AK-derived design. The ACE is their pistol variant. The charging bolt is moved to the left side, with controls on the right side. A polymer lower frame reduces weight to 6 lbs, as the milled receiver adds about a kilogram compared to a stamped unit. A chrome-lined barrel ensures long service life, with barrel length being 8.3 inches in the base model. The Galil ACE also features a Picatinny rail on the top of the receiver, and Picatinny tri-rail forearm with removable panels for adding accessories. The iron sights include tritium inserts in the front blade and two rear dots for night sight capability. The ACE can be had in 5.56mm NATO or 7.62x39mm. It requires MAGPRO or IWI magazines, as – unlike many other AK pistols – it doesn’t accept all AK magazines. It’s tactical, practical and has IWI’s build quality…but it will cost you as MSRP is $1,749. Uh, I’m sure Hollywood will love them; but are they good for anything? The century’s are good for shooting themselves to pieces. AR pistols are too trendy? The gun market for the clueless is rich these days. Take for example the AK Pistol. If I wanted one I’d just pick one up for a song on armslist after some bonehead bought one because the AK Pistol wasn’t yet trendy so it must be good, you know, for home defense. 5.45 out of a short barrel might not be so bad. Destroying what’s left of my hearing and having a stun grenade go off a few inches from my face doesn’t sound like a lot of fun. I’ll shoot rifle cartridges from rifles, or at least carbines, and my handguns will chamber handgun rounds. I guess there’s a few idiots out there that will buy them, or they wouldn’t build them. The one things that all 6 of these have in common is that they are as LOUD AS FVCK! Get a KX3 with threaded 14×1 and you can use it on a Draco. Why would you include a US made century gun. We all know they are crap and dangerous once you shoot them enough. There’s one floating around Instagram dropping a deuce in some poor guys face right now. For the love of God stop peddling their garbage. They had problems with poor quality hardening in the early run but they’re actually quite good guns now. Reading about the legitimate issues people had, though, I doubt I’ll convince anybody of it. V2 is just as bad. Cracking guide rails and trunnions. As long as you attach a stock to a pistol it then becomes an NFA item. Permanence of the stock plays no bearing whatsoever. PLEASE correct the article so we don’t have people committing inadvertent felonies. That part of the article was amazingly poorly written. I’m in the market for a 7.62×39 pistol with a brace. The only one even remotely interesting to me is the Arsenal, though a grand is a lot to part with plus whatever the brace costs. Does anyone have opinions on how long the barrel should be to reduce noise and minimize the loss of muzzle energy while keeping it as short as possible? Dr. Fackler’s studies show wounding due to temporary stretch cavity becomes significant when a projectile is moving above 2000 fps. Since you asked for opinions I think 7.62×39 is too slow for SBRs as it reaches that velocity very quickly or is below that velocity from the start. Out of a 16 inch barrel a 123 gr bullet will be going under 2000 fps at 120 yds. Shorten the barrel, shorten that range. I would go with a chambering of 5.56 or 5.45 in an AK pistol/sbr. I’ve got the Springfield saint pistol already, but I’ll have to do some research on what you’re saying as I am ignorant about it. I’ve got the century arms made in USA 16” everyone is bad mouthing as my entry level 7.62×39. I haven’t had any problem (yet) but I’ve only ran 1050 rounds through it shooting steel and paper. I was not a fan of the magpul furniture, the stock hurts your jaw after about 50 shots. I fixed the issue for me with some adhesive neoprene but the design is still poor ergonomics. A out of the box Draco ( Mini dragon)is a AWSOME firearm ! I’ve had one for over five years now and run approx. 6,000 rounds thru her! Very reliable and tuff as hell truck gun! I can place hand sized groups with iron sights at 100 yards no problem!!! I have nothing bad to say about this “AK PISTOL” with a Sig stableizing brace and four piece Bulgarian flash hider ! For those knocking this firearm, DONT! Try one out before you start downing out this platform ! This I one hell of a beast in a small package made to STOP and put down any threat that may come your way! I do not recommend this firearm for home defense due to the distructive power of the 7.62×39 round! Walls don’t stop it!!! Ted, can you hear me? Of corse I can hear you! I wear hearing protection ! I wouldn’t touch an American made Century Arms AK with a 10 foot pole. Better choice for a pistol like this would be 300BLK as it was designed for short barrels. That said, try this: 1) hold out your pistol in your normal shooting stance and note how far the end of the muzzle is from your body, 2) hold up a carbine and note how far the muzzle is from your body. You may discover that you can actually use a carbine and have the muzzle just as close to you or closer than these pistols. I would say carbines are NOT ‘too long’ for home defense. I keep both ready just in case. And yeah, they are crazy loud with lots of blast/flash (4 pc flash hider helps) and a 300 AAC is a better choice, but that’s not the point of the article. A few thousand steel case rounds in and it’s fine. Just ordered another case of 7.62×39 in fact. Ditto. No problems, great little Polaris Patrol gun. Why can you buy an ak for 50 to 100 bucks in the near east but we pay a grand? 1. Cold War supply dried up. 4. Third world country markets have no regulation/tariffs/taxes or law to worry about. Hey Sammy – If you’re going to dedicate an entire verbose paragraph to a 1911 joke, you might want to make sure you get the 1911 part right. That’s not a pistol! Any moron that thinks it is shouldn’t have 2nd amendment. That’s the kind of thought pattern that will eventually lose everyone their right to bear arms. You’re making it too easy for the anti gunners. Shhhh! Hush! As long as you fire it with one hand and don’t shoulder it , it a pistol!!! Thus the stableizing brace. Your making people think we may use it as a SBR!